The ingredients in this salad are sturdy enough to stand up to batch preparation techniques—you can serve it for dinner and then eat it for lunch over the next several days. Quinoa is a complete protein, so topping this tasty salad with chicken breast is optional. Bring water and quinoa to a boil. Cover and reduce heat to low. Simmer until water is absorbed and quinoa is soft, 12-15 minutes. To prepare vinaigrette, thoroughly mix lemon juice, honey, olive oil, salt and pepper. 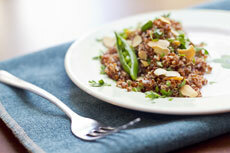 Combine quinoa, vegetables and seeds in a bowl. Toss salad with vinaigrette. Adjust salt, pepper and lemon juice as desired.